Under Construction 8:55 PM 5/31/2014 Technical Piece here. (b) not have their votes counted? 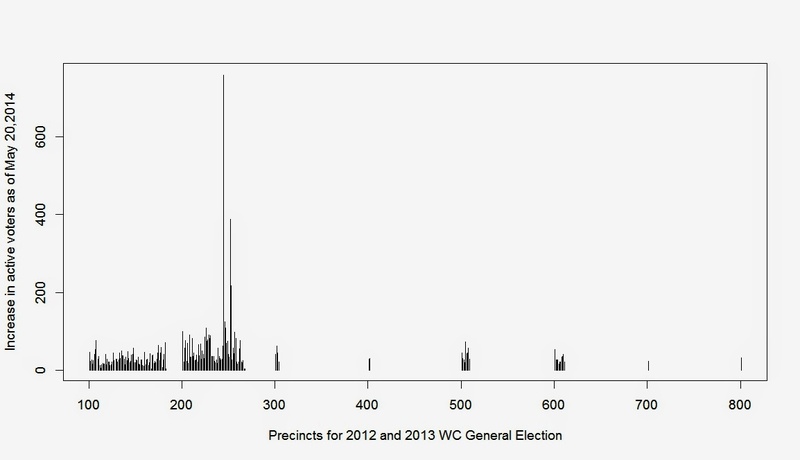 An original discussion of precincts with poor 2013 turnout is here. Let us examine some charts below the break. The charts below explicate five years of general election in Whatcom County for voters registered as of May 20,2014. This means that we are looking at election turnout numbers only for those people currently registered to vote as of May 20th, 2014. As of May 20th, the voter database for Whatcom County stood at 126283 registered voters. I present graphs with analysis. Click on these graphs to enlarge. The first graph below maps precincts vs. votes counted for the general elections 2009 - 2013. Clearly 2010 and 2012 are the elections with the most votes counted. Now let's look at those votes not counted.